We discussed a prior publication in the Archives of General Psychiatry about the decline of antidepressants use after the FDA black box warning. In a more recent study published in the same journal this prior study was criticized because it had some serious limitations. The study used prevalent use instead of incidence use. This means, used all cases instead of the new cases that started using antidepressants and they included all use instead of the use for depression. Antidepressant indications range from major depression to smoking cessation and weight loss, with varied suicidality risk. The warning for heightened suicidality risk was targeted at depressed patients. This new study used new antidepressant users from the targeted group (children, adolescents, younger adults 18-24 years) and a comparison group of nontargeted adults over a long period from 1997 to 2007 in a large cohort. 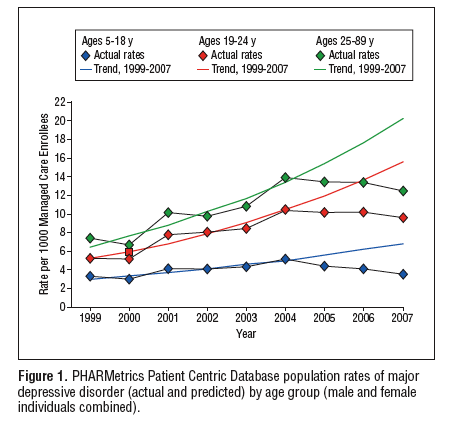 Diagnosing decreases persist. Substitute care did not compensate in pediatric and young adult groups, and spillover to adults continued, suggesting that unintended effects are nontransitory, substantial, and diffuse in a large national population. In all age groups, 5-18, 18-24 and 25-89, depression diagnosis rates were significantly lower than history predicted based. More specific 44% lower for pediatric, 37% lower for young adults, 29% for adults. The decline in SSRI prescriptions was 10-15%. Not only did SSRI prescriptions decrease in the targeted populations from 5-18 and 18-24 but it also had an unintended effect. The same decline persists in the adult cohort, which was never a target of the advisory or warnings. Luckily no increase in prescriptions of atypical antipsychotics or anxiolytics for depression was found. Psychotherapy increased significantly for adult, though not pediatric, cases. You could argue that the FDA warning worked. It did but it also spilled over to unintended groups. Moreover, since the debatable suicidality is also influenced by non prescription of effective medication in the targeted population and a clear shift in other forms of treatment such as psychotherapy is minimal also due to a lack of children and adolescent psychiatrists, some action is needed. I think these finding are not limited to the US but probably also apply to The Netherlands and other European countries. Use of SSRIs and Venlafaxine Decreasing among Dutch Children and Adolescents. What do you think? SSRI prescription drop associated with suicide increase in children? A decline in prescriptions and even diagnoses of depression is not necessarily a bad thing — and is a good thing if, as much suggested, we were OVERdiagnosing and overmedicating. In a perfect world, we recognize, diagnose, and properly treat every case of genuine depression — and have zero false positives (that is, we treat for depression only those genuinely depressed). It’s not a perfect world. We will always miss some; we will always erroneously Dx depression in people who have something else. The trick is to constantly correct swings too far in one direction or the other — and to do no harm. We were almost certainly right to pulling the reins on the trend toward higher rates of Dx and, especially, medication. it is good for antidepressants to be less used for the population of course. The increase or lowering in their prescription amounts are too hard to understand what they were caused for. I’m not sure about the US but in The Netherlands their is no hard evidence of overdiagnosing depression. Overmedicating could also be influenced by the efficacy of SSRIs also in more existential trouble instead of anxiety disorders and depression. My experience has been that being in existential trouble does not mean kids/adults are not depressed/anxious. My biggest struggle in my depression has been a search for meanining and purpose. This agonizing search began when I was very, very young and caused, or at least contributed to and continues to cause/contribute to severe depresion and anxiety. Very interesting. Might put up a post on this topic if it is OK. Thank you. An individual unbiased tone of voice in Msnbc inside the Tv show. This individual includes a seriously difficult immigration plan. This individual graduated on the Harvard School. At present he possesses his one Radio stations Show. He couldn’t just like any Usa chief executive.